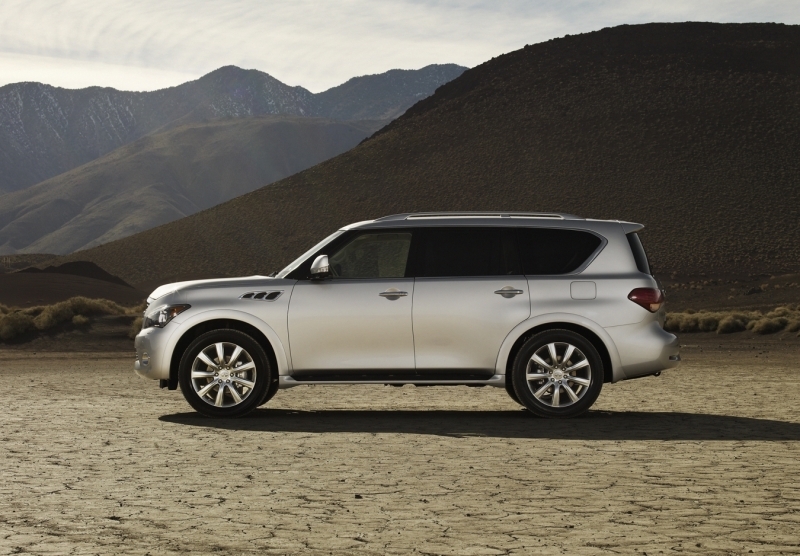 While we have always liked the QX from Infiniti, we thought it was more of a dressed up Nissan Armada than its own vehicle. 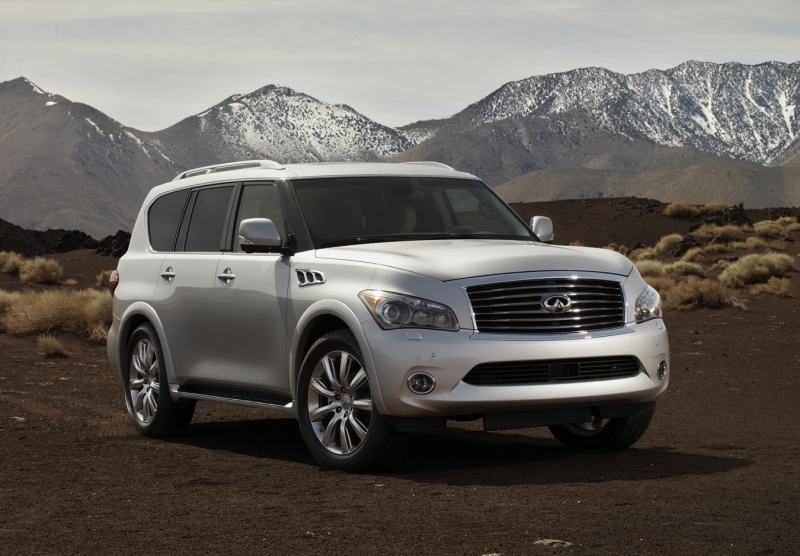 Apparently so did Infiniti, as they created a completely new-from-the-ground-up QX56 for the first time, which enters the market as its own stand-alone model for the 2011 model year. All the time that Infiniti spent engineering the new QX shows – it’s larger, more sumptuous and overall, reflects the brand ethos in a much more enlightened way. 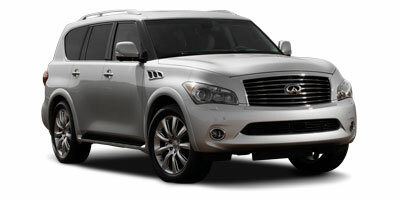 Infiniti has spared no expense in equipping the QX, and it shows – interior quality and refinement are exceptional. 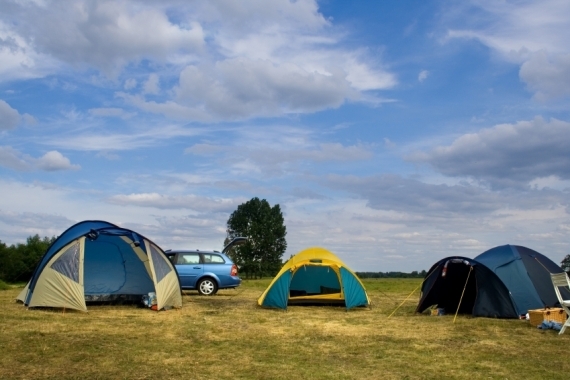 The standard equipment list is longer than we could begin to mention, which in our opinion is good thing. The QX56 is by no means a svelte compact, and sizable D-pillars make navigating city streets and congested highways a more difficult procedure. An awkwardly styled front-end means parallel parking is a bit of a mind game. Now, you’ll be forgiven for thinking this is no sports car – it’ll never hold a flame to the all-new M56, though they do share the same 5.6-liter V-8 – but, that said, for an SUV of its size, the fact that it doesn’t fall over at the mere sight of a corner is impressive. The ride is surprisingly compliant and comfortable even when you slap on the optional 22-inch wheels. Infiniti has made use of a clever suspension setup – they call it Hydraulic Body Motion Control – that will prop up one side of the car in a tight corner to reduce body roll, improving cornering feel and driver confidence. The engine, the aforementioned 5.6-liter V-8, delivers even this behemoth to ticketing speeds in no time with 400 horsepower, 413 lb-ft of torque and an engine note that’ll make your right foot feel a whole lot heavier. But if you are a bit more disciplined than us and can resist the temptation, you’ll be rewarded with an amazingly smooth ride that’ll take the edge off long distance trips. 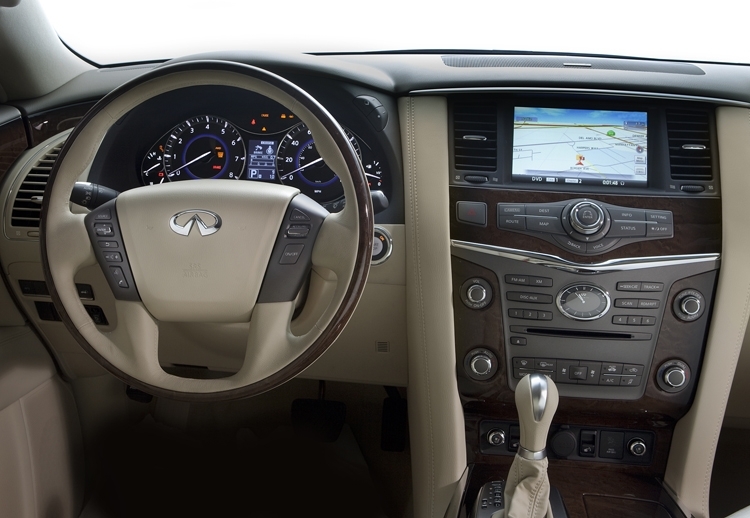 While a 5.6-liter, 400 horsepower V-8 with a seven-speed transmission are the only engine and transmission options, the QX56 comes available in either two-wheel or four-wheel drive trim – the latter sporting a computer-controlled transfer case and three different drive settings, Auto, 4H and 4L, to tackle all that your weekday commute can think to throw at you. 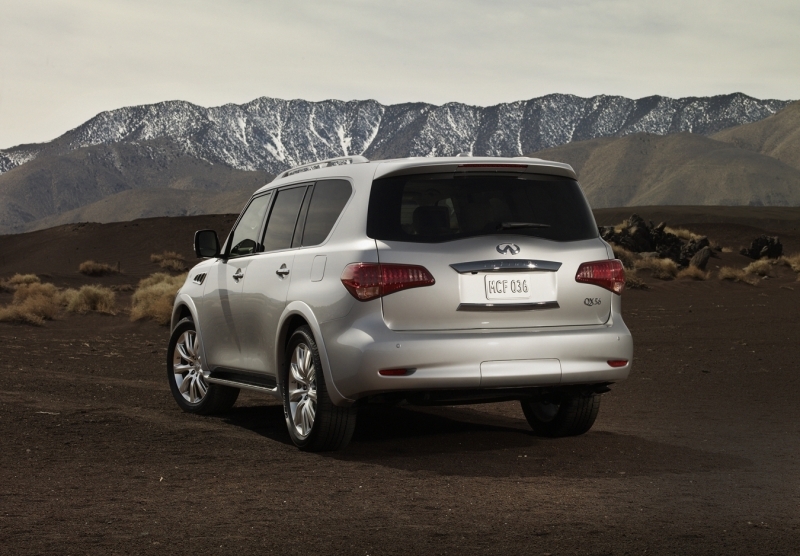 Infiniti has equipped a huge amount of standard options and chances are if you can dream it up, the QX has it. But for those who want a little more kit and a couple quieter passengers, there’s the $2,450 Theater Package that equips two rear-facing, seven-inch monitors mounted on each headrest with wireless headphones and remote control. Also available is the $5,800 Deluxe Touring Package with 22-inch wheels and tires, an Advanced Climate Control system, climate controlled front seats and heated rear seats, as well as the fancy hydraulic suspension system. As with any car of this caliber, there are more fancy electronics than the International Space Station and the available $2,850 Technology Package only sweetens the deal. 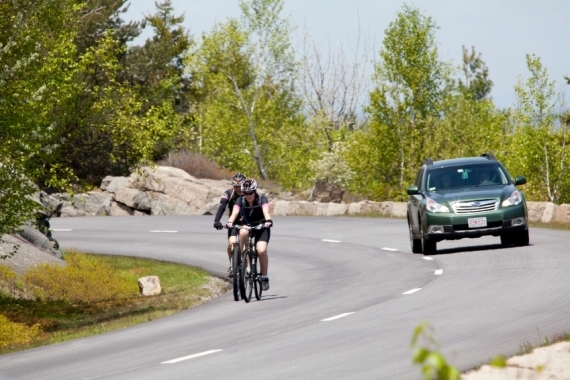 The extra coin nets you Intelligent Cruise Control – designed to monitor and maintain a safe following distance while cruise is engaged – Lane Departure Warning and Prevention systems to prevent drifting in and out of your lane, and Distance Control Assist which can slow the vehicle automatically to prevent a collision. It’s no surprise that an SUV of this size with an equally massive V-8 has abysmal fuel economy. That said, the 14 mpg found in the city and 20 mpg on the highway is on par with other SUVs of its kind. It’s safe to say that Mother Nature is not a fan of the QX56. Carpooling was never really our thing, so seven seats seems a bit excessive. Either way, despite a slightly cramped third row, every single one of them is profoundly comfortable and outfitted in beautifully stitched leather. But naturally, we prefer the driver’s seat. It is here where the QX’s quality really shows as silver and wood accents surround the soft-touch surfaces and high quality controls. While we would prefer a few less buttons on the slightly cluttered center stack, our overall impression of the cockpit is an extremely good one. To put it lightly, we have a lot of questions for whoever penned the QX, but just in case beauty truly does reside in the eye of the beholder, we’ll keep our mouths shut. The optional 22-inch wheels do a nice job of giving the QX a more impressive road presence while standard Bi-Xenon HID headlights put out a healthy amount of light when the sun goes down. The base 2WD QX56 is priced competitively at $56,700 while the 4WD trim comes in at a slightly higher $59,800. Anyone considering the QX might also consider looking over the Mercedes-Benz GL, the Land Rover Range Rover, and either the Lexus GX 460 or LX 570, though we’d venture a bet that none can match the extensive list of standard features. From the time we spent in the large SUV, we have to say it’s a really good thing that Infiniti went back to the drawing board with the new QX. In today’s day and age of badge engineering, it’s good to see – and drive – a new vehicle that tries to forge its own way.